Are you feeling overwhelmed and don’t know where to turn? Are you having thoughts of wanting to hurt yourself or someone else? Are you worried about someone else who may be struggling with depression or other mental health concerns? Bluebonnet Trails Community Services wants to help you! 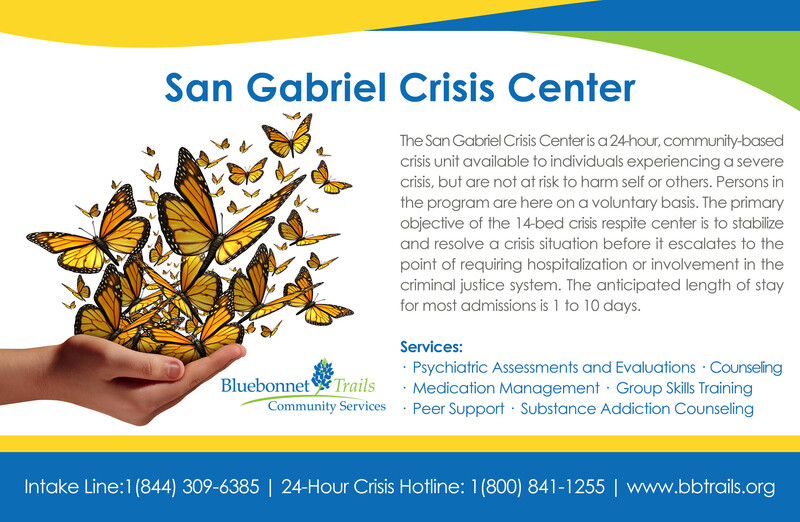 Our well-trained staff are dedicated to assisting individuals experiencing a behavioral health crisis. Our staff is available to talk with you 24 hours a day, 7 days a week through our Crisis Hotline at 1-800-841-1255. Mobile Crisis Outreach Team (MCOT): Our team is made up of an array of qualified and highly trained mental health professionals who are available for immediate response 24 hours a day throughout our 8 counties. MCOT services focus on providing timely crisis assessments and development of a treatment plan unique to the individual’s needs. Our team provides services where the crisis is taking place; this can include your home setting, school, the local emergency room, places of business, or anywhere within the community. 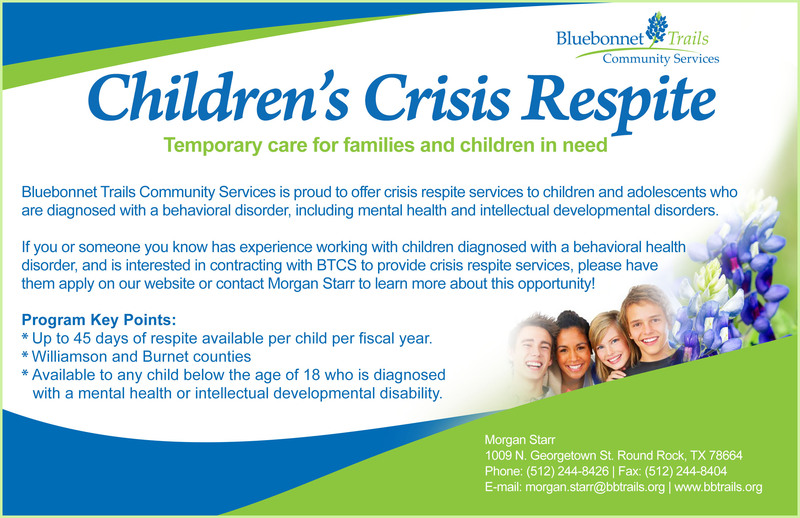 Crisis Respite Unit: Located in Williamson County in Georgetown, Bluebonnet Trails offers a 12-bed voluntary Crisis Respite Unit, serving all individuals throughout our 8 counties. Here our well-trained staff assists individuals in crisis, through assessments and evaluations to determine the most suitable care plan for recovery. The average length of stay for individuals is 7 days, which includes linking to resources, providing skills training, group therapy, and psychiatric stabilization for individuals to return back to their community successfully. 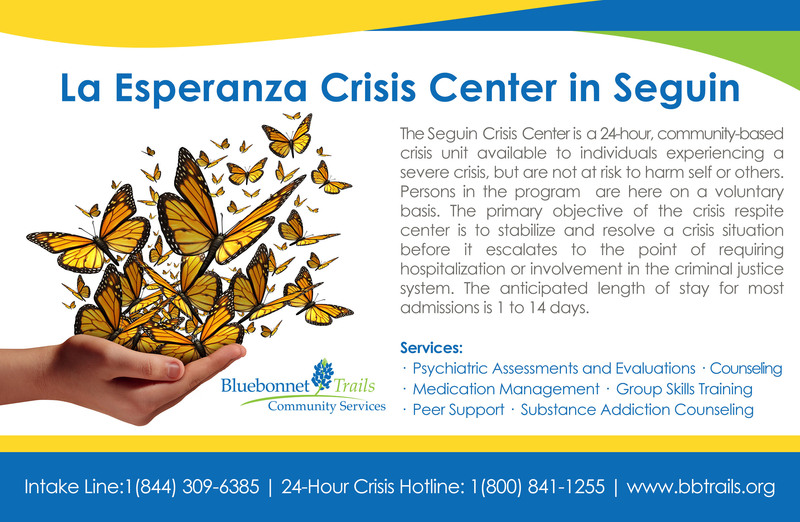 Extended Observation Units: Bluebonnet Trails offers 2 Extended Observation Units (EOU) to provide services to those in crises. 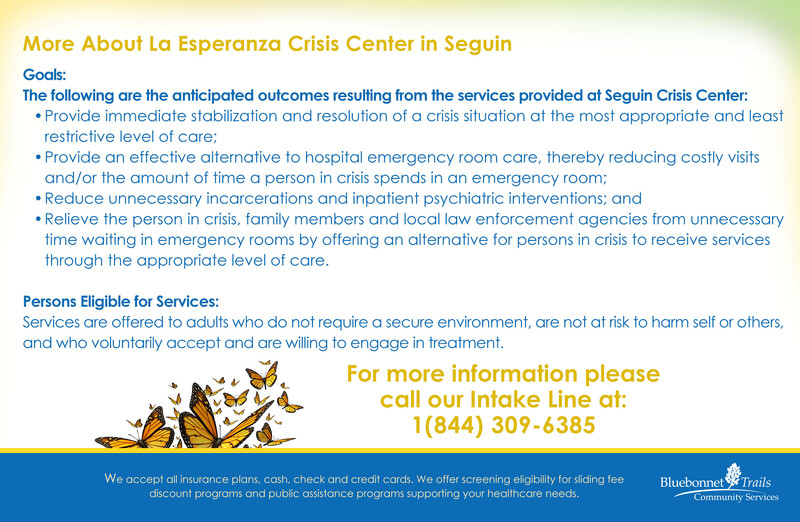 We have a northern location in Georgetown with a 4-bed unit and a southern location in Seguin with a 6-bed unit, both providing services to individuals within our 8 counties. Both of our EOU locations offer involuntary or voluntary admission for those in crisis and need of care and short-term stabilization. Once admitted, individuals will be seen by a doctor within the first hour, ensuring appropriate medications are provided and our licensed nurses will monitor symptoms providing support 24/7. At our EOUs, we offer up to 48 hours of care, working with the individual to an appropriate step-down care plan, with a goal to decrease the need of inpatient hospitalization.